Please forgive the delay in my post today. I was experiencing "connection problems." 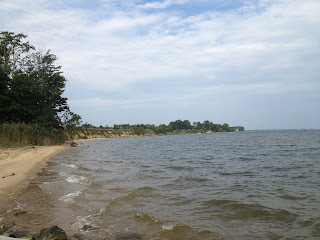 A spur-of-the-moment trip took me from the river house here in Virginia near the Potomac River to someone's home in a lovely but very secluded area. Beautiful and wooded, but no connection. Thus. . .the delay in my post. I just returned to the river house now, so I'll make this post short. summer heat and humidity that is ever-present Back East, as I call it. Thankfully the river house has A/C, so when it gets hotter in the afternoon, I flip that switch and cool off. My house in Colorado actually does not have A/C by choice. The humidity is low in Colorado, so any heat we have in the summer simply does not feel hot and sticky even with all that Colorado sunshine. Of course, I'm someone who can more easily take heat than cold. :) That helps. How hot is it where you folks are? Hot and sticky? Barely warm? Cloudy and muggy? We're four women writers at a cottage in Northern Ontario. Today, it's bucketing rain with a threat of thunder storms. Great for reading, cooking and gossiping. Well, today is a miserably hot and humid day in the NYS Capital Region. And, of course they are predicitng heavy and severe storms (we have had our fair share this year.) On days like this I stay home, too hot to be out and about, and it would be a great pool day but with the storms brewing I guess I will stay in the A.C. I never can seem to make it in fast enough when they roll in. I actually can't complain since it hasn't been overly hot and humid yet this Summer. I agree, it is easier to handle this weather than the extreme cold, but I don't think I could ever leave the Northeast/New England. But we do get some very varied weather in this neck of the woods. Houston - its muggy. Although the rains have came to an end last weekend, they have left behind humidity! Oooo, reading, cooking, and gossiping. Sounds like great fun. :) I love it. I know what you mean about thunderstorms, Margaret. I love summer storms. So dramatic (says the novelist). Rumbling thunder, jagged lightning strikes. Of course, as frequent as they are back here in Virginia, nothing can compare to the drama of summer thunderstorms in the Colorado Rockies. I will actually pull the car to the side of the road and watch the storms roll in over the foothills (beginning of the Rockies). Jagged lightning strikes. Crackling thunder. Anonymous---I've watched the weather maps and you folks are having a bad time. Burning heat and no rain. We've had a typical June in Colorado with heat and thankfully rain, too. Now it's July and I'm back East, but I hope the West won't go thru burning heat in July. Usually July is hot, hot with little rain. Let's keep our fingers crossed. I'm in Beaumont RD so my weather is close to that in Houston, hot and muggy. I grew up without a/c but the older I get the more grateful I am for the a/c. I would hate to live without it. Getting thunder right now. Hoping that new gutter in back will work well!! We live near Annapolis. My hubby's brother used to live in Reedville Va! Very pretty there. Only one traffic light!